Sean Quirk is the managing member of Juniper Green, LLC. He was born and raised in the United States. As a college student in Minneapolis, he heard a CD by Huun-Huur-Tu, and his passion for Tuvan music was ignited. In the fall of 2003, Quirk traveled to the Republic of Tuva on a Fulbright fellowship to study Tuvan music, including the fascinating multiphonic vocal art of xöömei, or throat singing. 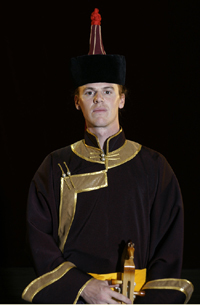 He was accepted into the Tuvan National Orchestra, and he has mastered both the Tuvan and Russian languages. Since early 2006, Quirk has been the manager and interpreter for the ensemble Alash. On their U.S. tours, Alash has shared their musical and cultural heritage with American concert-goers, schoolchildren, students, and the elderly through their dedication to grassroots-level cultural outreach. Quirk has translated two works by Tuvan authors, a book on the Tuvan way of life viewed through the prism of horses, and a 50-page treatise on the music of Tuva in the 20th century by ethnomusicologist Valentina Suzukei. He has been interviewed on radio ("WNYC") and television in both the U.S. and Tuva. In 2008, the head of the government of Tuva named him a "Distinguished Artist of Tuva" in recognition of his accomplishments promoting Tuvan music and culture around the world. In 2013, Sean curated the Tuvan delegation to the Smithsonian Folklife Festival, One World, Many Voices: Endangered Languages and Cultural Heritage, where he emceed the Tuvan performances.